David Groenfeldt, Director of the Water-Culture Institute, has a new book out from Routledge. All the details are here. 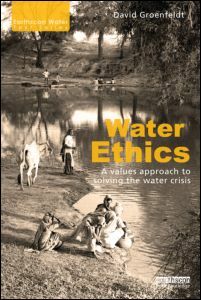 This book introduces the idea that ethics are an intrinsic dimension of any water policy, program, or practice, and that understanding what ethics are being acted out in water policies is fundamental to an understanding of water resource management. Thus in controversies or conflicts over water resource allocation and use, an examination of ethics can help clarify the positions of conflicting parties as preparation for constructive negotiations. The author shows the benefits of exposing tacit values and motivations and subjecting these to explicit public scrutiny where the values themselves can be debated. The aim of such a process is to create the proverbial ‘level playing field’, where values favoring environmental sustainability are considered in relation to values favoring short-term exploitation for quick economic stimulus (the current problem) or quick protection from water disasters (through infrastructure which science suggests is not sustainable). The book shows how new technologies, such as drip irrigation, or governance structures, such as river basin organizations are neither “good” nor “bad” in their own right, but can serve a range of interests which are guided by ethics. A new ethic of coexistence and synergies with nature is possible, but ultimately depends not on science, law, or finances but on the values we choose to adopt. The book includes a wide range of case studies from countries including Australia, India, Philippines, South Africa and USA. These cover various contexts including water for agriculture, urban, domestic and industrial use, the rights of indigenous people and river, watershed and ecosystem management.